My daughter Katherine celebrated her 8th birthday on Monday. I took the day off from work to spend some time with her. We went ice skating and shopping and had dinner. I saw a picture of a pink ombre cake on pinterest and have not been able to get it out of my head. I began searching for a good vanilla cake recipe. And with almost no effort at all I came across a wonderful one! My daughters and friends agree with me that this cake is very moist and flavorful. I finished it with vanilla cream cheese frosting. (Again, not my recipe. All I did was follow it) Please visit Glory's blog, Glorious Treats, for both of these recipes. She did quite a bit of research to come up with them. I think that you will be pleased. As you can see the top layer is thinner than the bottom three. That is because I did not divide the batter evenly into quarters before coloring it. I just added a tiny bit of red food coloring to the batter for the second layer and then added a bit more for the top two. This cake was not much to look at from the outside but was a surprise when cut into. There is a lot of room for improvement but it sure was fun to make and serve! It looks moist and yummy! What a wonderful birthday it sounds like she had Michele! And that cake looks delicious!! Hope your doing well and have a lovely day! LOVE it Michele!!! I want one!!!!!! Love the little banners on the top too:) You should do more foodie posts since you are good at it:) Better than those stinkin chili dogs!!! Ha!!!!!! Michele, what a fun cake this would be to make! It's a great idea -- and made even more special because of the time spent with your daughter. So glad you shared! gorgeous cake...the best part is that is was made with love!...and that makes it perfect! so gorgeous! love the bunting you made for it. happy birthday to your daughter. What a pretty cake! I love a good vanilla cake, I'll have to check this recipe out. Thank you for sharing! I just found your beautiful blog and love it. This cake looks wonderful! I think it is beautiful! I love the cream colored icing with all the pretty gradations of pink! It would be a beautiful wedding cake... I want to make one now, Good job! What a beautiful cake!! I want to make it to!!! What a totally gorgeous cake - I would love someone to make me one of those! I just signed up as your latest follower & I look forward to popping back soon for some more lovely inspiration. Love how cute that cake turned out! I've never seen one like that before. The pennant on top makes it so festive too. 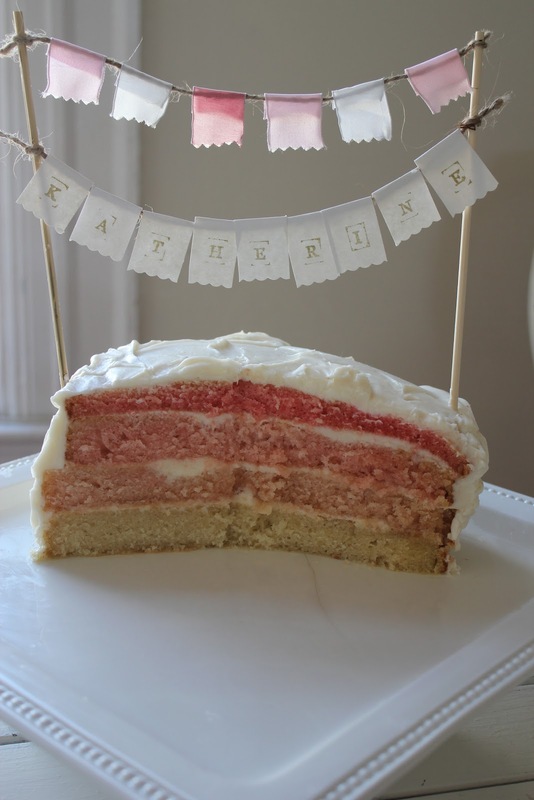 What a lovely pink ombre cake, especially love the buntings on top--I'm sure your daughter loved it! My mouth is watering looking at that cake and how sweet is your banner on top?!! I'm impressed. WoW! This is simply adorable! It was very sweet of you to take your day off and spend it with your 8 year old. Ice skating sounds fun especially when your daughter. My mom always worked really hard to make me beautiful cakes for my birthday.